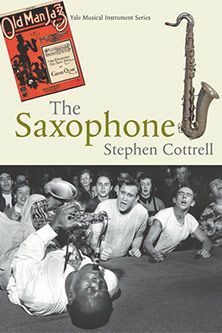 Professor Stephen Cottrell launches his new book, which examines the history of the saxophone, at his inaugural lecture. Despite its fame, or perhaps infamy, the saxophone has had very few scholarly books dedicated to it. Professor Stephen Cottrell hopes to amend this with the publication of his book 'The Saxophone' which was launched last night at his inaugural lecture in the Performance Space at City University London. The book examines the full social, historical and cultural trajectory of the instrument and considers how and why the saxophone, with its idiosyncratic shape and sound, should have become important for so many different music makers around the world. Dinant, a small town 60 miles south of Brussels, may appear an unlikely place birth place for the inventor of a musical instrument that the Italian composer Gioachino Rossini would describe as having 'the most beautiful sound that I know'. But it is there on 6 November 1814 that Adolphe Sax was born. Twenty six years later Adolphe, an accomplished clarinettist and inventor of musical instruments, arrived at the Belgian Industrial exhibition with a variety of clarinets and bass clarinets, and something described as 'un saxophone en cuivre' - a saxophone in brass. The instrument, which Adolphe then perfected after his move from Belgium to Paris, was not warmly received by everyone. A London reviewer in 1852 perceived the instrument to be "a musical monster, neither fish nor flesh, nor good red herring", while an aggrieved letter-writer to the Musical World in 1854 advised that the saxophone "should be obliterated forthwith." From these inauspicious beginnings the saxophone went on to become one of the most recognised instruments in the world, accruing a musical and symbolic significance far beyond that for which Adolphe Sax might have reasonably hoped. During his lecture Professor Cottrell gave the audience of musicians, academics and saxophone fans a whirlwind tour through the evolution of the insrument, from its humble beginnings to its adoption by jazz musicians in the United States in the 1920s and 30s. After the lecture the audience were treated to a performance by Matt Racine and Rob Sherwood, pictured, current third-year students on City's BMus Music course, followed a performance from Professor Cottrell and fellow City lecturere Ian Pace of Jean Francaix's Five Exotic Dances. Find out more and buy Professor Cottrell's book.